Junkie Company B.V cares a lot about your privacy. We therefore only process data that we need for (improving) our services and we handle the information we have collected about you and your use of our services. We never make your data available to third parties for commercial purposes. On our website you will find a number of web forms where we ask you to enter personal data, such as your (company) name, address, e-mail address, web address and (mobile) phone number. We only use this information for the purpose for which you provided it. If you place an order in our webshop, you will receive a number of e-mails concerning the status of your order. Our shipping partner (MyParcel) receives from us your e-mail address to keep you informed of the progress of the delivery. Our customer data is stored in the CRM of our web shop software and then only used for administrative purposes. We use the servers of CCV Shop for e-mail services. All e-mail traffic is confidential and not transparent to the processor. 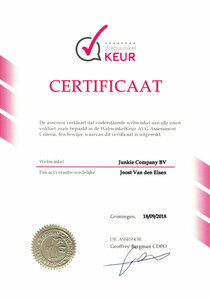 Junkie Company B.V uses the services of CCV Shop to host the website. This is a trusted service provider based in the Netherlands. All data that you provide to us via our website are stored (temporarily or otherwise) on the CCV Shop servers. CCV Shop has applied the necessary security techniques and it is forbidden for the processor and its employees or auxiliary persons under the agreement between the processor and Junkie Company BV to provide data or to make available to third parties, unless they are obliged to do so on the basis of a legal prescription. The processor periodically makes backups of the stored data. The same guarantees and conditions apply to these backups. We only use your data for the benefit of our services. This means that the purpose of the processing is always directly related to the assignment you provide. We do not use your data for (targeted) marketing. If you share information with us and we use this information to contact you at a later date - other than at your request - we will ask you explicitly for this. MyParcel (PostNL): If you place an order with us, it is our job to have your package delivered to you. We use the services of PostNL for the execution of the deliveries. It is therefore necessary that we share your name, address and residence details with PostNL. PostNL uses this information only for the purpose of executing the agreement. In the event PostNL engages subcontractors, PostNL will also make your data available to these parties. Quick start: We use the services of Snelstart to keep track of our administration and accounting. We share your name, address and residence details and details regarding your order. This data is used for managing sales invoices. Your personal data is sent and stored protected. Fast start is mandatory and will treat your data confidentially. Snelstart does not use your personal data for purposes other than those described above. In some cases, Junkie Company B.V may be obliged to share your information in connection with government tax or criminal investigations on the basis of a legal obligation. In such a case, we are forced to share your data, but will oppose it within the possibilities that the law offers us. We keep your data as long as you have an account with us. This means that we keep your customer profile until you indicate that you no longer wish to use our services or delete your account. If you indicate this to us, we will also consider this as a request for forgiveness. We also keep the information about your purchase in order to answer any questions about the warranty or other questions or complaints about the product. On the basis of applicable Dutch and European legislation, you have certain rights with regard to the personal data that are processed by or on behalf of us. We explain below which rights these are and how you can invoke these rights. You always have the right to inspect the data that we process or have related to your person or that can be traced back to you. You can submit a request to that effect to our privacy contact person. You will receive a response to your request within 30 days. If your request is accepted, we will send you a copy of all data with an overview of the processors who have this data, under the mention of the category under which we have stored this data. You always have the right to have the data that we process or have processed that relate to your person or that can be traced back to you by another party. You can submit a request to that effect to our privacy contact person. You will receive a response to your request within 30 days. If your request is granted, we will send you copies or copies of all information about you that we have processed or that have been processed by us by other processors or third parties on the e-mail address known to us. In all probability, Junkie Company B.V can no longer continue providing the service in such a case, because the secure linking of data files can then no longer be guaranteed. In such cases, you have the right to object to the processing of your personal data by or on behalf of Junkie Company B.V. If you object, we will immediately stop the data processing pending the settlement of your objection. If your objection is well-founded, we will make copies and / or copies of data that we process or have made available to you and then permanently discontinue the processing. You also have the right not to be subject to automated individual decision making or profiling. Junkie Company B.V does not process your data in such a way that this right applies. If you are of the opinion that this is the case, please contact our contact person for privacy matters. We use functional and analytical cookies. The functional cookies are necessary for the proper functioning of the website. For example, they ensure that the information you want is displayed quickly and correctly every time you visit our website. No authorization is required for placing functional cookies. We use the analytical cookies to analyze how often our website is used. If the analytical cookies do not have a major impact on your privacy, permission is not required. To gain insight into where we look and click on our website Hotjar cookies are used.